Casino games are fun! Essentially that is why we love them and why we play them in our spare time. In the past people had to walk, drive or even fly in order to be able to enjoy a game of poker, or a spin on a slot machine, but nowadays, thanks to developments and progress in the IT industry it is possible to enjoy casino games in the comfort of your home, or basically whenever you are at the moment. Here’s one great online casino for you - www.goldenrivieracasino.com. If you’re a fan of casino games and you have an Android phone, you should have a look at this Android Casino Apps website. And in this article, we are going to present you the top 3 casino and poker games for Xbox. BestBuy Deal of the Day: Minecraft: Xbox 360 Edition - $13.99! BestBuy Deal of the Day!Grab Minecraft: Xbox 360 Editionfor $13.99 (Reg. $19.99) at Amazon! With the World Cup 22 days away, Xbox is getting into the festival mood with a 40 percent sale on FIFA 14 for Xbox One and 360 - that's right, not the World Cup game that just came out. That discount takes the sportsballer down to $36 (£30/42 euros), and as with all of this week's deals, that price stays good until Monday, May 26. If you prefer your contact sports with more bloodshed, the Killer Instinct Ultra Edition is 50 percent off for Combo Break owners, and 12 percent off for everyone else. While the base game is free, the Ultra Edition adds all Season 1 characters, costumes and accessories as well as the classic arcade game from the 90s. Finally, Bandai Namco has a selection of Xbox 360 games on sale that includes musically classic RPG Eternal Sonata for just over $5, the offline-playable Soul Calibur 2 HD for $10, and the Serkis-enhanced Enslaved for around $5 too. For the full list of games and their discounts, hop on over to Major Nelson's. Xbox 360 owners looking to jump into the crime-ridden world of Los Santos can get a deal on Grand Theft Auto 5 at the Microsoft Store this week. For a limited time, Microsoft is offering boxed retail copies of Grand Theft Auto 5 for just $29.99 -- a savings of 50 percent off of the game's regular retail price. 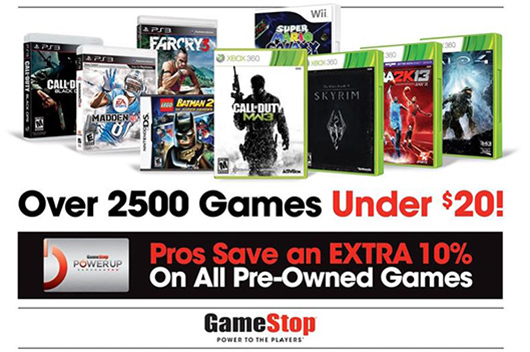 GameStop is celebrating spring with an Easter Weekend event, offering a "buy 2 get 1" on a select stock of used games. The promotion begins today at all GameStop retail locations across the United States and online. The deal comes with certain stipulations, however: only games priced under $20 are eligible, with the free title coming at equal or lesser value. Though the promotion undoubtedly means PS4 and Xbox One titles are off the table, previous generation software is up for grabs. According to GameStop, the company "has recently reduced a large percentage of games from the Xbox 360 and PlayStation 3 libraries to $20 or less." The promotion ends on Sunday, April 20.